Story: There's no need to fear. Underdog is here! Everyone's favorite canine superhero is back and about to take to the skies as he's never been seen before -- hilariously re-imagined in this live-action comedy-adventure inspired by the classic cartoon. 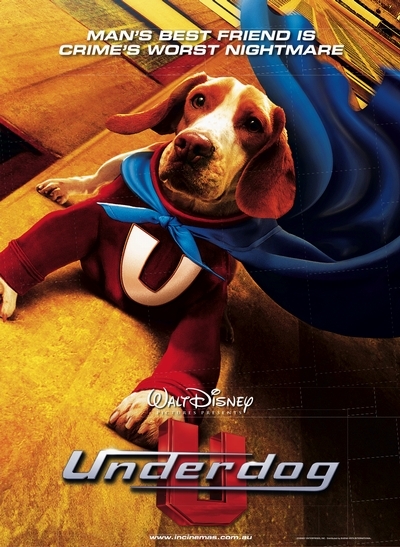 "Underdog" is the story of how a nation found a savior in the least likely of forms: a humble, lovable Beagle who becomes a flying hero who can fight crime while speaking in playful rhyme. "Underdog" features a cast of both canine and human talent, including Jim Belushi ("According to Jim"), Jason Lee ("My Name Is Earl"), Patrick Warburton ("Seinfeld"), Peter Dinklage ("Elf," "The Station Agent"), Brad Garrett ("Everybody Loves Raymond") and Academy Award nominee Amy Adams ("Junebug. "), along with rising young actors Alex Neuberger and Taylor Momsen ("How the Grinch Stole Christmas"). But the real stars of the film are the adorable, well-trained dogs who win the day, including Leo the Lemon Beagle in the role of Shoeshine/Underdog; Ginger, a Cavalier King Charles Spaniel as Polly Purebred; as well as Bronco the Rottweiler as the villainous Riff Raff. The story of Underdog's mysterious origins begins in the wake of an accident in the high-tech lab of the maniacal scientist Dr. Simon Barsinister (Dinklage). Suddenly, an ordinary, down-and-out young Beagle named Shoeshine finds himself with extraordinary powers, not to mention the unexpected ability to turn his bark into real speech. Now, armed with a "fetching" superhero costume, this unlikely caped crusader and humbly self-described Underdog (voiced by Jason Lee) vows to protect the beleaguered citizens of Capitol City - especially one beautiful Spaniel named Polly Purebred (voiced by Amy Adams). When a sinister plot by Barsinister and his overgrown henchman Cad (Warburton), threatens to destroy Capitol City, only Underdog can save the day.